• Excellent AC or DC operation, even on a "buzz box"
POSTALLOY® 218HD hardfacing is a unique concept in hardfacing technology and is over 90% efficient. It is tubular, permitting higher travel speeds and much higher percentages of carbide forming elements contained in the core than with ordinary flux-coated electrodes. The tubular design offers very smooth operational characteristics. Remove old hardfacing and any fatigued base metal. POSTALLOY® 250 gouging electrode is useful for this purpose. 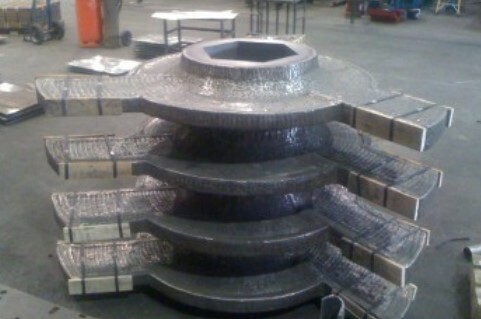 Preheat from 200-400°F (93-204°C) is recommended for steels with a carbon content of .25 to .45. Steels with a higher carbon level should be preheated from 400-700°F (204-371°C). Do not preheat austenitic manganese steel. Use a minimum arc length equal to about the diameter of the electrode. Hold the electrode at 90° to the work surface for proper application. Do not apply more than two layers. On manganese or hardened steel, an intermediate or cushion layer of POSTALLOY® 207 is recommended.